The 17 HMR rimfire round has been a huge success since its introduction. Millions of rounds have been sold, the major rifle-makers all offer 17HMR rifles, and varminters worldwide have embraced this innovative, high-velocity rimfire cartridge. The big factor favoring the 17 Mach 2 is PRICE. 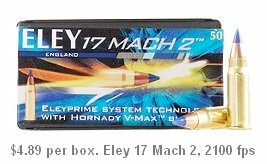 You can shoot the 17 Mach 2 for $0.10 per round compared to $0.26 for the 17HMR. 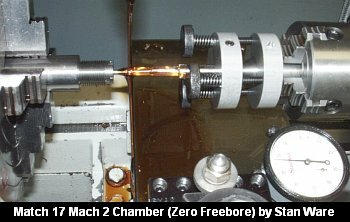 The Mach 2 is less than half the cost of 17HMR. 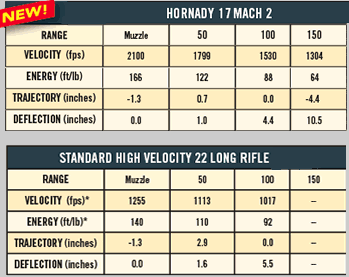 Here is a chart showing current pricing of the 17 HMR vs. the 17 Mach 2. We’ve done extensive testing with the 17 Mach 2 in a Hall-actioned benchrest rig built by Stan Ware of SGR Custom Rifles. 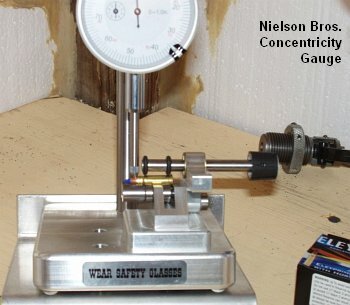 With ammo sorted for length and concentricity (using a Nielson Brothers concentricity gauge), our little 17 Mach 2 has demonstrated remarkable accuracy–with many 1/4″ groups at 50 yards. Still, even with sorted ammo, don’t expect the 17 Mach 2 to run with the best (i.e. $14/box) 22LR match ammo. Typically, with the 17 Mach 2, you’ll get one shot out of five landing unpredictably out of the group. There are many reasons for this — excessive run-out, flawed bullet tips, bad crimps, even shaved jackets. Our studies suggest that 17 Mach 2 ammo would be more consistent, and more accurate, if it was loaded to a lower muzzle velocity with the bullet seated longer. Crimping needs to be more uniform. We’d also like to see Hornady chamber the 20gr XTP bullet offered in the 17 HMR. Still, the 17 Mach 2 round has much to offer the varminter and club-level paper puncher. It runs 1000 fps faster than a 22LR, and bucks the wind much better than a 22LR at 100 yards. 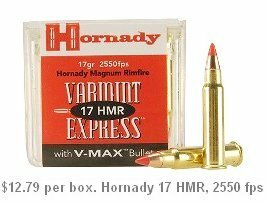 At $4.00 to $5.00 a box, it is less than half the cost of 17 HMR, and one-third the cost of the super-premium 22LR. We let three top 22LR benchrest shooters try our 17 Mach 2 recently. To a man, they agreed this round is “fun to shoot” and “offers great promise”. If the ammo-makers can improve quality control, this round may, some day, have a place in target competition, particularly with the highest-grade 22LR ammo now topping $20.00/box (for new Lapua X-ACT ammo). 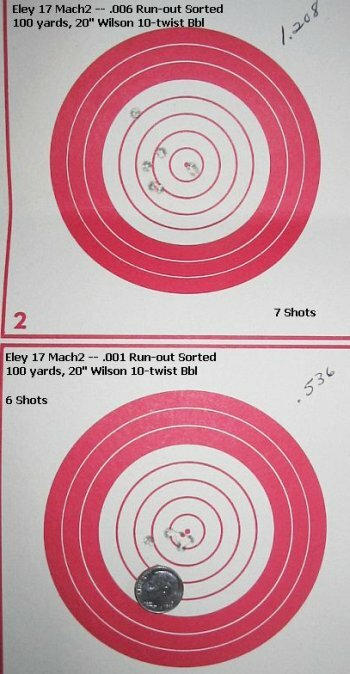 Here are ONE HUNDRED-Yard Groups Shot with Eley 17 Mach 2 Ammo. Note HUGE Effect of Concentricity Sorting. Top target shows 0.006″ Run-out ammo. Bottom Target displays 0.001″ Run-out ammo. Share the post "17 HMR Price Hikes Spur Renewed Interest in 17 Mach 2"
The Cactus is limited to two classes, 10.5-lb Light Varmint and 13.5-lb Heavy Varmint. Participants will shoot at 100 yards on Saturday and at 200 yards on Sunday. Ocock explains: “Bench rotation will be 30 benches to the right after the 100-yard stage. We anticipate three (3) relays. We will squad three shooters per bench.” The full 2-day Match Fee is $90, while the 1-day fee is $50. 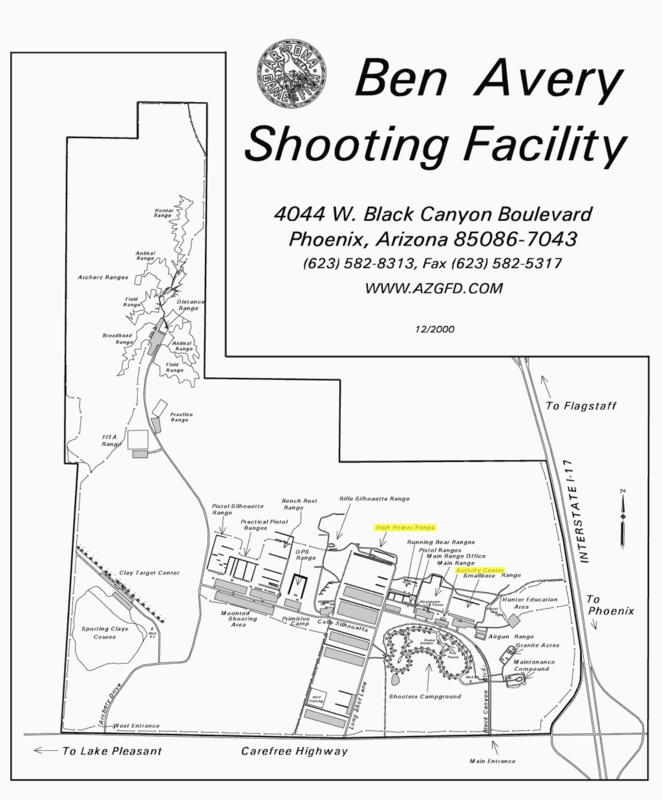 The Ben Avery Range will be open for practice February 26-29 (Tuesday through Friday). Camping is available at the Ben Avery facility for $10/day. 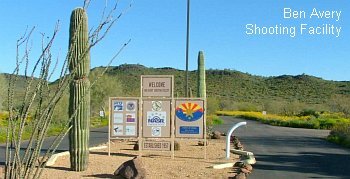 Share the post "Cactus Classic in Phoenix March 1 and 2"
If you shoot a 22-250, or are just interested in the history of the cartridge, Peterson’s RifleShooter Magazine offers a fascinating article by Terry Wieland. 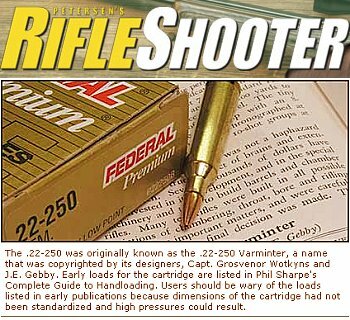 The author explains how the 22-250 was developed in the late 1930’s and was initially known as the 22-250 Varminter. In 1963 the round gained popularity when Browning chambered it in a production rifle — even before factory-loaded ammo was available. Then, in 1965, the round became “official” when Remington standardized the 22-250 with “Remington” added to the name. Remington produced 22-250 Rem ammo and sold Rem 700s chambered in the “new” cartridge. Share the post "22-250 Cartridge History in RifleShooter"